We have just returned from a grand weekend with my daughter and her family in South Carolina. What could beat a weekend with jazz, great food, a trip to the mountains (more about that later), and a visit to a world class brewery? I must say that it is fun to double date with your daughter. We returned home to find a good deal of color in the garden, much of which has made itself into this week’s Monday vase…actually there is enough for three. The color in the large cobalt blue vase is from Loropetalum rubra, hellebores, and ‘Debutante’ Camellia japonica. Added to the arrangement is greenery from ‘Winter Gem’ boxwood and Berckmann’s arborvitae. A closer look at the arborvitae (below) will show its tiny creamy flowers that will become lovely seed capsules in late summer. 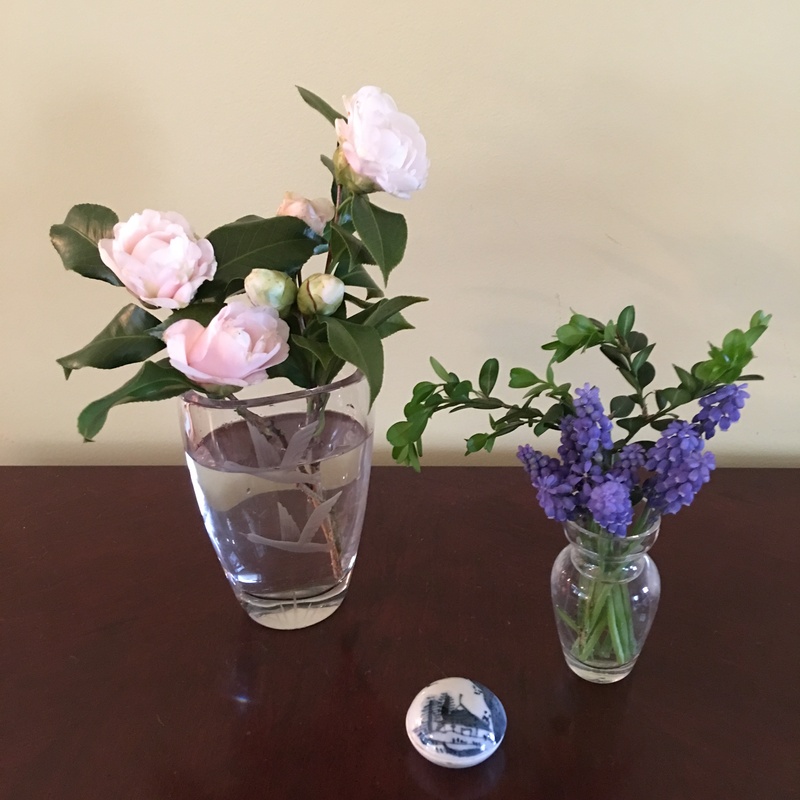 Other colorful plants are opening now, and my Arranger couldn’t resist putting them into two small vases to add to the party…one with the first blossoms of Camellia japonica ‘Governor Mouton,’ and another with Muscari armeniacum. The small prop is an incense container from a Japanese Tea Ceremony set. This grand idea of sharing what’s showing in our gardens each Monday is the creation of Cathy at Rambling in the Garden. Please visit her site and see what she and others are sharing from their gardens this day. 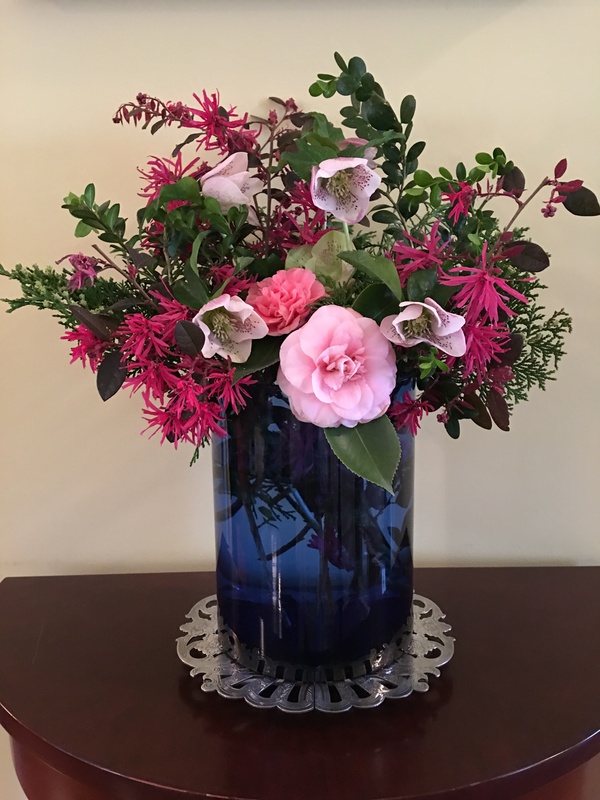 This entry was posted in Gardening, In a Vase on Monday and tagged Camellia japonica 'Debutante', Camellia japonica Governor Mouton, hellebores, Japanese Tea Ceremony, loropetalum 'Rubra', Muscari armeniacum. Bookmark the permalink. Thank you, Cathy. It is a blessing to have enough to make a decent vase this early, but this is a crazy year…in so many ways. I hope we can keep the vases coming until “real” spring arrives..
Beautiful! I love these colors. Thank you! Thank you, Anne. We are so fortunate to have them at this time of year here. Your arranger outdid herself this week with that lovely collection inside the blue vase. Wonderful to enjoy such blooms this time of year. Thank you, Susie. I just hope this weather lasts into spring. I agree with Cathy your vase is so abundant for a February Monday. I think thus might be my favourite vase of yours. Congratulations and compliments to your arranger. My Arranger thanks you for your encouragement. That first vase is really quite something! Your arranger has done an excellent job again, choosing the blue vase too. Must be a delight to have some of the spring garden indoors. 🙂 Lovely to see Muscari. I am still looking forward to seeing some spring bulbs flower here, but there are little green shoots everywhere! Delight is just the right word. Thanks, Cathy. My “other” spring bulb…ipheion…is starting to open and will have to be photographed soon. Your main vase is stunning! Bravo!!! Which is the flower with the strappy petals? For a second I thought it was Monarda. It is a purple loropetalum.